Police: Man wanted for killing 3 captured in Chester Co.
CHARLESTON, W.Va. -- After an eight-hour manhunt spanning three states, Pennsylvania State Police on Tuesday captured a man accused of fatally shooting three people in West Virginia. 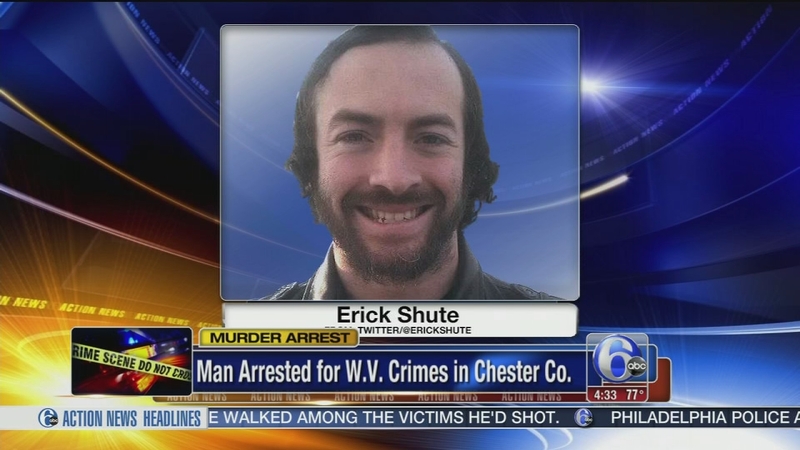 Erick Shute, 32, was taken into custody in Chester County, Pennsylvania, said police in Pennsville Township, New Jersey. Shute is accused of fatally shooting three men Monday near Cacapon Resort State Park in rural Morgan County, West Virginia, The Journal in Martinsburg, West Virginia, reported. The victims were identified as Jack Douglas of Great Cacapon, and Travis Bartley and Willie Bartley, both of Hedgesville, Morgan County Sheriff Vincent Shambaugh told The Journal. Shambaugh said the deaths were caused by gunshots from a .223-caliber rifle in what was apparently a property dispute Monday evening. Late Monday, Pennsville Township, New Jersey, police had issued an alert on their Facebook page saying they were looking for Shute, who used to live there with his mother. Pennsville Police Chief Allen Cummings said Shute was involved in the anti-government sovereign-citizen movement. Sovereign citizens are people who reject their U.S. citizenship and don't recognize laws, taxes and other types of government authority. In 2009, Shute drew the Pennsville community's backlash when he hung an American flag upside down, calling it a message of distress about the government. In 2011, Shute was charged with aggravated assault of a police officer, resisting arrest and obstruction of justice. Shute went into the Pennsville Police Department in 2011 to ask if they could sign a peace treaty letting him drive his car without registration, said Bill Brennan, first assistant prosecutor in Salem County, New Jersey. They said he left when they wouldn't agree to it. Cummings said Shute was then pulled over for having fake license plates he made of cardboard. Shute also had a fake driver's license he made himself. Cummings said during a traffic stop, Shute then rolled up his car window on an officer's arm. Brennan said Shute was convicted in 2012 of fourth-degree resisting arrest, but the jury could not reach a verdict on aggravated assault. Shute received a fine with no jail time, but spent a week in jail before that because he didn't show up to two court hearings in the case, Cummings said. During the manhunt, Pennsville police also moved two judges, including the judge who oversaw the police assault case, into hotels because Shute had previously threatened them, Cummings said. He said some officers had their wives stay with relatives during the manhunt, since Shute knew where many of them lived in the small town. Shute once filed a lawsuit that went nowhere against Pennsville Township and the police department, and personally delivered a subpoena to Cummings' home, Cummings said. "We were concerned, that's for sure," he said. "I had bad feelings. I was very concerned about where he was going to go, what he was going to do. After committing a murder ... sometimes people make decisions that they have nothing else to live for, and you kind of wonder if he's going to come back and take people with him."